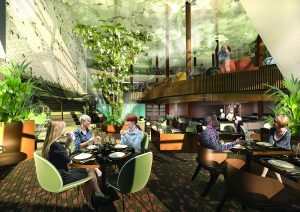 Amid the lush Brooklyn Botanic Garden on Tuesday evening, Celebrity Cruises’ revealed a dramatic new venue for its upcoming ship, Celebrity Edge, which debuts December 2018. 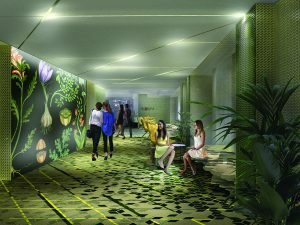 The new space – Eden – is a unique concept that fuses iconic design with cuisine and entertainment, which the line says will excite all the senses through experiential moments. Eden exemplifies the innovative outward-facing design of the new Edge Class of ships, which aims to connect cruisers to the sea and transform how they experience each destination. 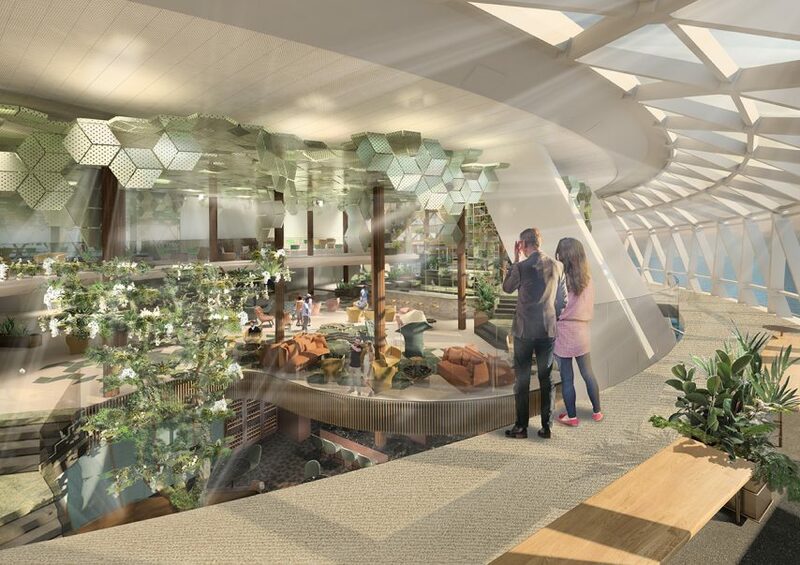 Spanning three decks at the aft of the ship with almost 7,000 square feet of glass that reaches 32 feet high, Eden is a design and architectural feat, brought to life in collaboration with internationally renowned design and entertainment visionaries. To put the space into perspective: The scale of Eden, measuring 368,640 cubic feet, is bigger than the Hayden Planetarium in New York City, and Eden’s area, at 12,650 square feet, is larger than the Van Gogh Museum atrium in Amsterdam. Three innovators partnered with Celebrity to help create this dramatic, multistory venue, including veteran Scott Butler of Wilson Butler Architects and internationally renowned designer Patricia Urquiola, who has never designed a venue at sea before. Celebrity also engaged Queen of the Night creators Variety Worldwide, who have been blending unconventional theater with dining and nightlife for years. The result is an individualized, ever evolving theatrical journey that puts guests at the center of the performance. When it came time to design a new ship, Lisa Lutoff-Perlo, president and CEO of Celebrity Cruises said they really wanted to amplify all the pillars of the line: design, accommodations, destinations, service, and culinary. And if they were going to amplify design, she said, they needed to make a bold statement and find some amazing world-renowned designers. Eden will be a transformational venue. By morning, Eden is a serene, relaxing escape with expansive views. In the afternoon, Eden becomes more playful with culinary, cocktail, and wine demonstrations, hands-on enrichment seminars, and tastings. The afternoon also features performances from sitar players to aerialists. The evening brings Eve at Eden, a sinful fusion of performance art, culinary exploration, and nightlife that promises to indulge guests’ every sense in the Eden Restaurant where “Edenists” will serve a choreographed series of experiential culinary temptations sure to surprise and delight. 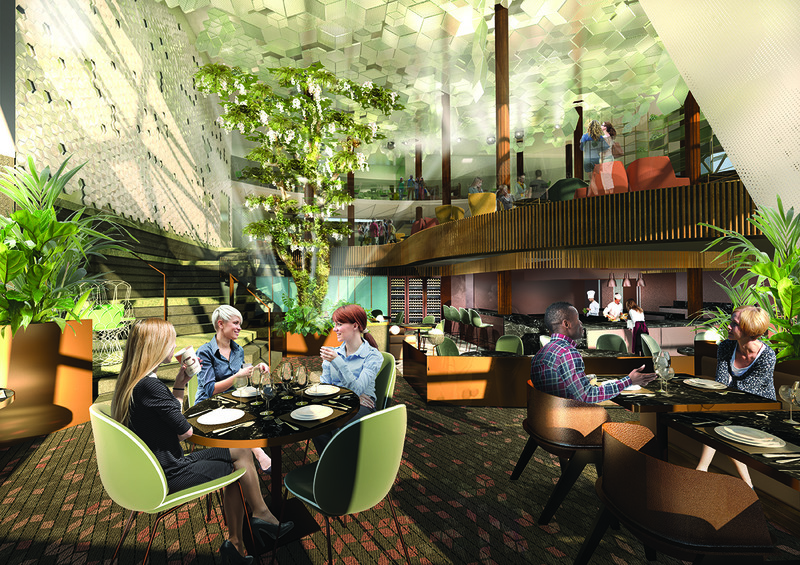 As dinner ends, guests will be prompted by sensory cues to tempt them back upstairs, past the Tree of Life – the continuation of tradition and evolution of the iconic living tree installation onboard Celebrity’s heralded Solstice Class ships – to Deck 5. Here, the Library of Plants towers 18 feet above Eden Bar, offering its bounty of fresh ingredients and garnishes for hand-crafted, artisanal cocktails. “When people think of traditional cruise ship entertainment, there’s a very specific image that people have in mind, but the exciting thing about Eden is we’ve actually been invited to break so many of those rules,” said David Ley, Director, Variety Worldwide. Eden’s breathtaking design by Scott Butler was inspired by the golden spiral as generated by the Fibonacci sequence. Represented in nature through the bloom of a rose or the curl of a snail’s shell, the golden spiral is brought to life through the thoughtfully crafted architecture of the venue. Eden features a 90-meter ramp enveloping the space, which enables guests to meander through the space on a serpentine journey of discovery. “When creating Eden, my goal was to create a connection to the sea in a space that will stir imaginations and leave lasting memories of the travel experience,” said Scott Butler, AIA, Founding Partner, Wilson Butler Architects. 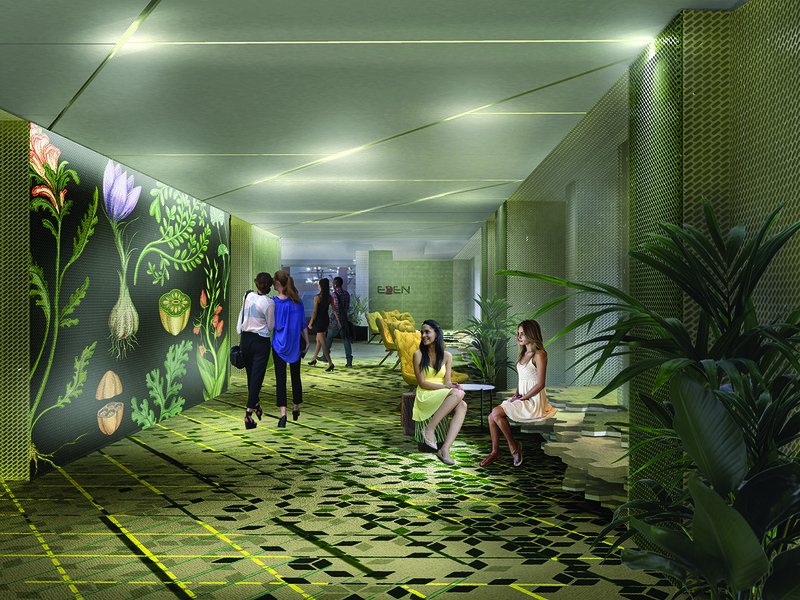 Patricia Urquiola designed some of the key features of Eden, including the towering Library of Plants and the impressive hanging plant pillars. Her signature furniture is also used throughout the space. “In working on Eden with Celebrity, I wanted to design a dynamic environment that changes from morning to night, so guests experience something new every time they visit,” Patricia Urquiola, Designer, Architect, Founder of Studio Urquiola. Stay tuned for the next big reveal, which Lutoff-Perlo says to expect in the first quarter of 2018. Celebrity Edge will homeport in Fort Lauderdale, Florida, making her first sailing December 16, 2018. She will sail 7-night Eastern and Western itineraries, with the option to book back-to-back sailings for a 14-night journey. Celebrity Edge will be joined by three sister ships in 2020, 2021, and 2022.